The Pros and Cons of A Hanging Treehouse - Treehouse by DesignTreehouse by Design - So, you thinking about building a tree house? I came across the not-so-popular idea of a hanging treehouse from an article I came across in the Las Vegas Review-Journal. 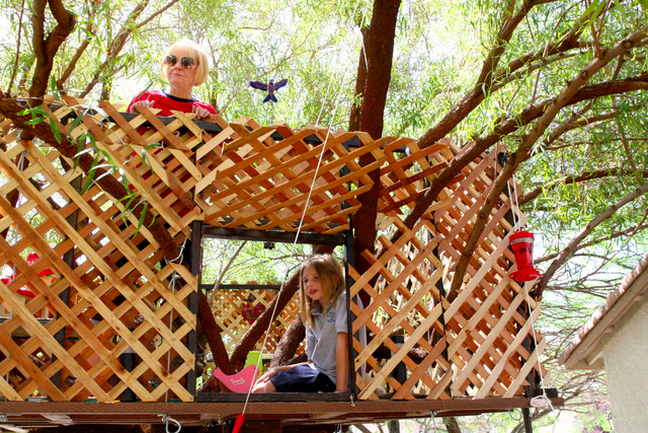 Phil Marco of Henderson Nevada built this hanging treehouse for his grandchildren over the spring and early summer. Phil recounts how when he consulted with a Lowe’s staff member, he was told the idea wouldn’t fly. But he persisted and built what, as far as I know, is the world’s first hanging treehouse! I really like the idea because it turns a very old idea on its head. Instead of building from the bottom up, Phil built from the top down. It just goes to show how many ways you can think about and build a treehouse. I love that this grandfather kept going with his idea because it shows what can happen when you follow your dreams. His treehouse is ripe learning ground for anyone else wanting to build a hanging treehouse. To help, I’d like to point out what I think he did right and what could be improved upon. Phil used large c-clamps in his treehouse. As you can see at the 59-second mark of the video featured in the article, The clamps have long bolts which leave plenty of room for widening as the tree grows over time. Very smart! Phil also braced his treehouse with foldaway legs that can be folded down when his grandchildren are playing in the hanging treehouse. It’s a nice touch that allows them to run underneath the treehouse without obstacles when the kids are playing on the ground. Another very nice touch. The most obvious potential source of trouble is the cables suspending the treehouse. As the tree grows, these cables could girdle the limbs and kill them over time. This could be solved by leaving more cable at the ends of the loop and slacking making the loop larger as the tree gets bigger. There’s a little room to do so, but likely not enough to sustain years of steady tree growth. The other potential design problem is movement. As the tree sways, the cables will translate this sway through the rigid platform, eventually pulling it apart under the stresses. One way to avoid this downside is to allow the platform some give. If the platform can be hung independently of the tree trunk, it would be able to move to accommodate the flexion in the branches. Incorporating used tire rubber and a bit of looseness in the joints would also help this hanging treehouse weather the years more gracefully. Kudos to Phil Marco for building what hopefully will become a more popular style of treehouse — the hanging treehouse! Post a comment if you have any feedback on how to improve this design for future builders (maybe even yourself). Your input could help accelerate the evolution of this exciting treehouse design. In the meantime, you might want to check out the latest treehouse book, Green, Hidden and Above: The Most Exceptional Treehouses. It’s due out in two weeks, but you can order it on Amazon to get it quickly. Amazon’s editors voted this book Best of the Month, so it’s definitely got it going on! In this article, which mentions Green, Hidden and Above, you’ll also find some important discussion of sound treehouse designing and building ideas. Have fun!